I am the author of 20 published books. I’ve written intense psychological suspense, gritty police procedurals, a book about a serial killer in South Sudan, and a series about the rough and tumble of the Klondike Gold Rush. And now I write cozies. Why? Because I was asked to, and because I found out that I love writing cozies. Sometimes it’s fun just to write for fun. And I hope you’ll find my new Year Round Christmas series from Berkley Prime Crime to be fun. It’s about the town of Rudolph, New York, self-anointed as America’s Christmas Town. The protagonist is Merry Wilkinson, owner of Mrs. Claus’s Treasures, where you can find everything you need for need for holiday decorating. And, if her father Noel, the town’s Santa Claus has been in before you, you might find things you didn’t know you need. But you really do! In the first book in the series a newcomer to town questions Rudolph’s commitment to the real spirit of Christmas. But, in mystery novels even into the nicest towns murder and mayhem must fall. Everyone is thrilled when a journalist from an international travel magazine comes to Rudolph to write an article on the town. 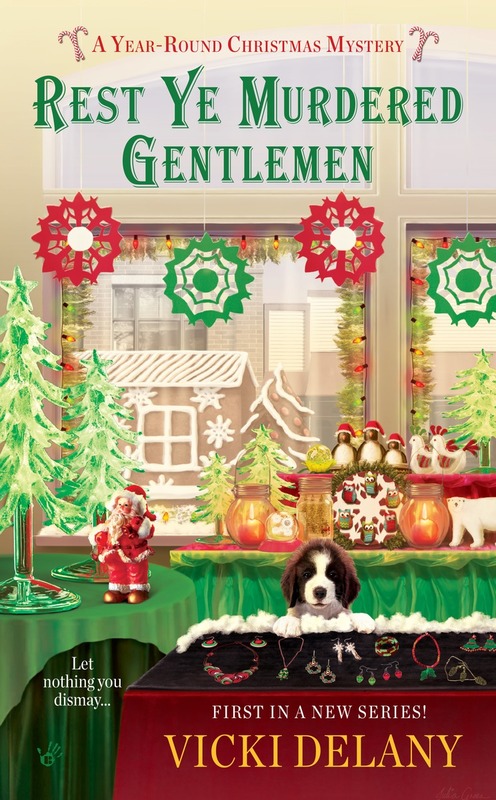 They are not so pleased when he dies from eating a poisoned gingerbread cookie made by none other than Merry’s best friend, Vicky, owner of Victoria’s Bake Shoppe. It might be up to Merry to find the killer and save the reputation of the town before it becomes the Ghost of Christmas Towns Past. This holiday season, why not pop into America’s Christmas Town and meet Merry and Vicky and the gang and help them celebrate Christmas.